Escape the everyday with the Orleans Rocking Chair set from the Hanover Outdoor Collection. 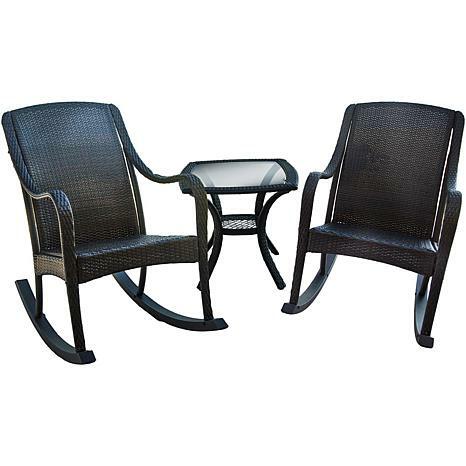 Bring outdoor comfort to your home with this collection of wicker rocking chairs and tempered glass-top side table that features sturdy, powder coated steel frames with premium all-weather wicker. This wicker is hand-woven, flexible and fade-resistant, which means it stays like new season after season.Elegantly styled and constructed with top quality outdoor materials make this collection the perfect choice to rock your cares away. Weight: Chair approx. 24.64 lbs. (each) Table approx. 17.63 lbs.